This borough is the area of Rubbish Cut service. We are a crew of friendly, experienced and professional workers. We will gladly offer you rubbish clearance that is very affordable and effective. Also, we will make sure that the previously cluttered place, will be soon clean and friendly. Living in a healthy and clean environment is imperative for people’s well-being and happiness. That is why when we dispose of garbage, we keep that in mind. We make sure that all the waste that we manage is recycled and stored properly. In some kinds of litter, there are many types of rubbish that need to be taken care of and grouped before they can be handled in the regular way. 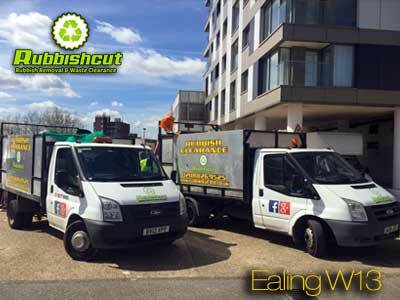 We provide rubbish clearance services in Ealing for many types of waste and we guarantee that every kind of it is managed in a safe and responsible way. 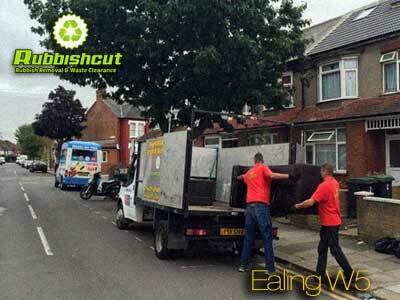 When it comes to the pricing, our company tries to be the most affordable rubbish clearance crew in Ealing. Contact us in any way you find the most convenient i.e. call us or email us. And if you have any doubts, we will be happy to resolve them. We will gladly provide you with an additional price estimate, so that you know all the details necessary before hiring us. If you are not satisfied with the deal we offer, we do not mind renegotiating the estimated cost of service. Do not hesitate and contact us. The London Borough of Ealing is a Western part of Outer London. It is known as a “Queen of the suburbs” and is characterised by its multicultural population, the majority of which are Polish or Asian people. This fact has had a great influence on the cuisine in Ealing, as its streets provide tourists and locals with the variety of tastes. Interestingly, this area was once a rural village and now it is called a ‘cosmopolitan area full of history’. Ealing owes its large Polish community to the World War II. The past and dramatic events have forced some Polish armed forces to stay in this area. What is more, in 2011 this borough was characterised by the highest UK’s proportion of Polish speakers. Additionally, the London Borough of Ealing is claimed to be one of the most beautiful boroughs of London. It has a wide variety of shops, such as antiques, craft shops and a agricultural market. In August, locals and tourists can enjoy Britain’s largest free jazz festival.